Krk’s fortification walls consist of several town gates, castles and two independent towers. These fortification walls date back to the 6th century BC. 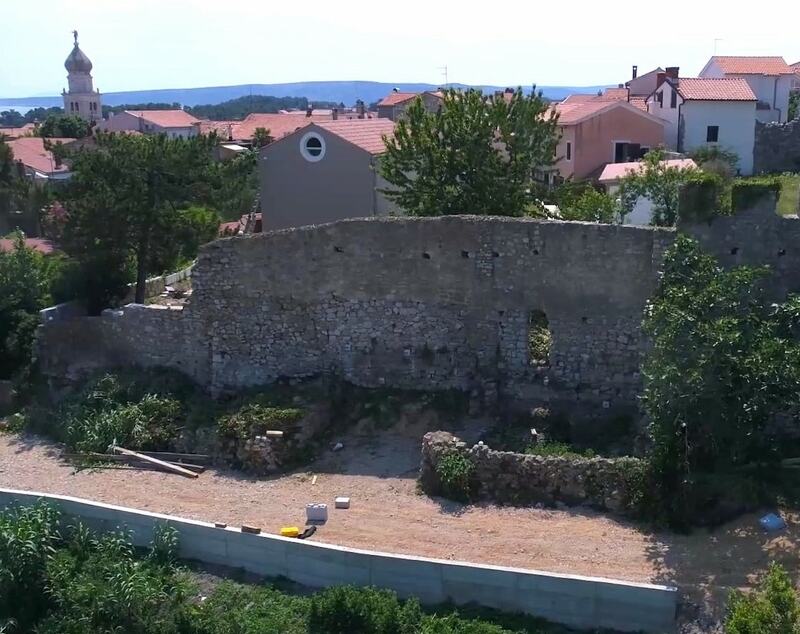 Those prehistoric walls were mentioned for the first time in an inscription of their renewal from the 1st century BC, which is situated today in Frankopans’ castle. This massive and unsightly stone, rough-hewn by hand, actually carries the oldest known inscription in the Latin language and letter on the Croatian territory. 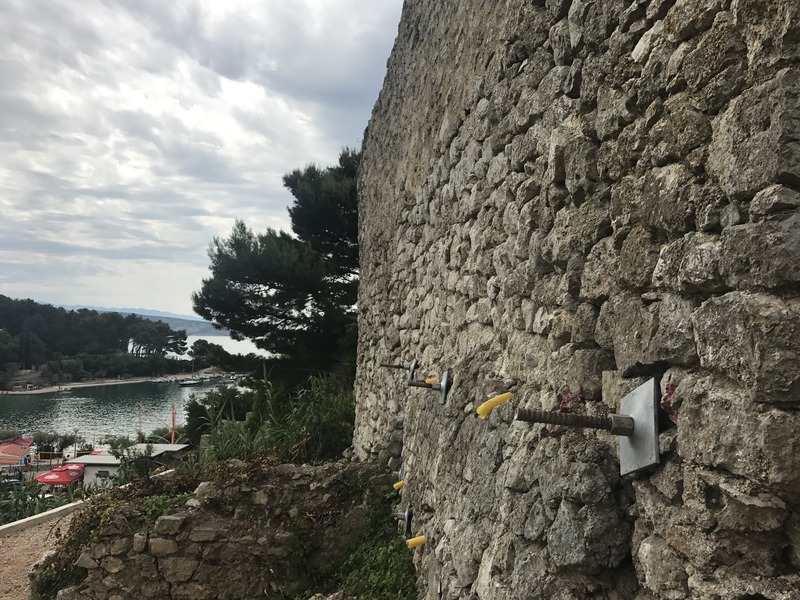 Fortification walls are a frequent occurrence in cities on our coast and one of our projects included a remediation of one in the city of Krk. 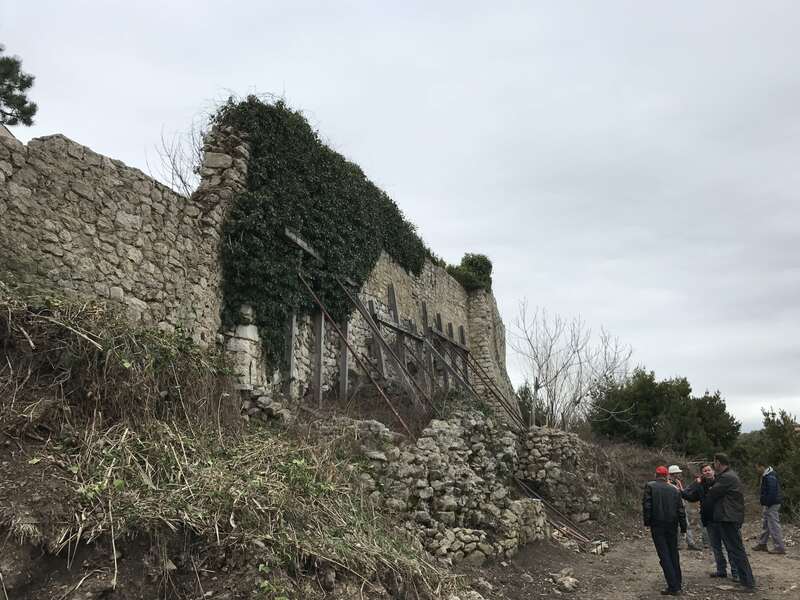 To be more precise, the eastern walls that are located near the coastal zone between the street of Krk Emigrants and the Galija Street. These walls are a part of a cultural heritage and are registered as a cultural resource. 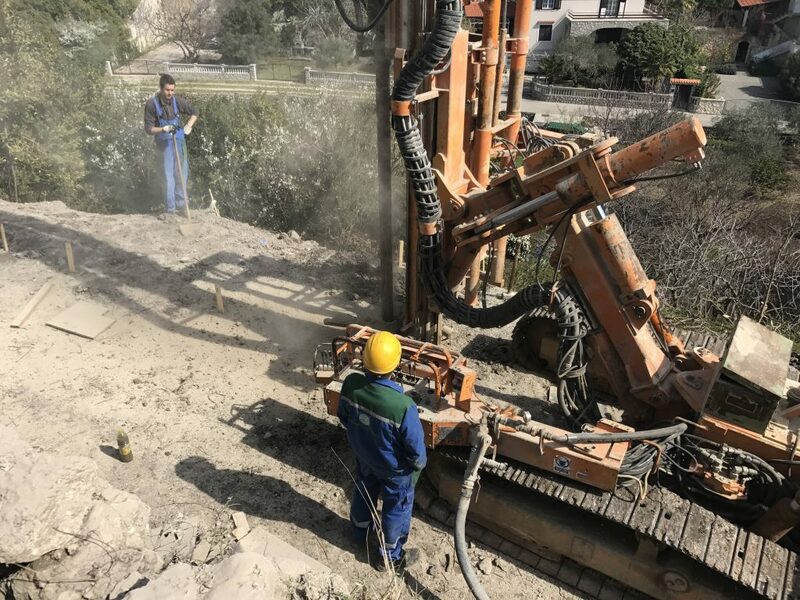 As a basis for the wall remediation design of the fortification wall we conducted geotechnical investigation works which consisted of trial pits, engineering-geological mapping of the terrain and trial pits and geo-radar and geoelectric investigations. 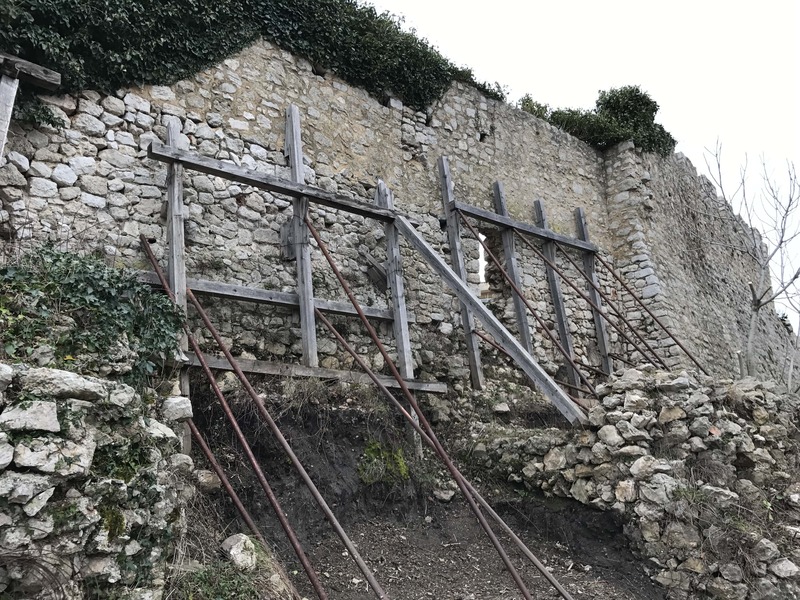 Geotechnical investigation works determined that the foundations of the existing wall were executed relatively shallow with a thickness of about 40 cm and a widening from the wall of 10 cm. Foundations of the fortification wall, existing stone dry walls and two defensive towers (discovered by archaeological exploration) are executed in surface deposits. 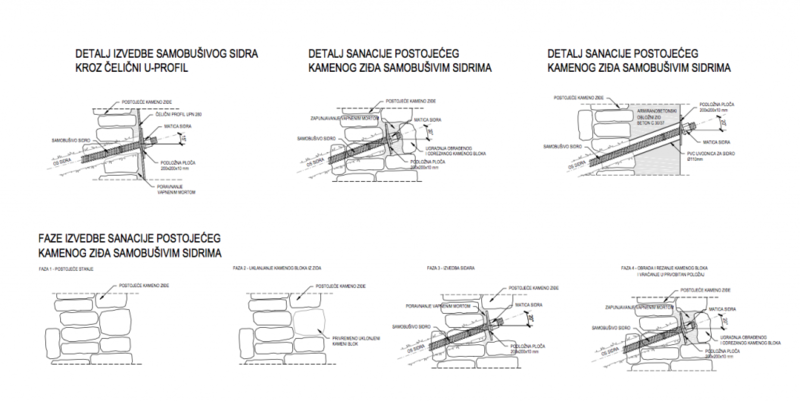 The wall remediation was temporary done by a support structure of metal pipe profiles and wooden beams. 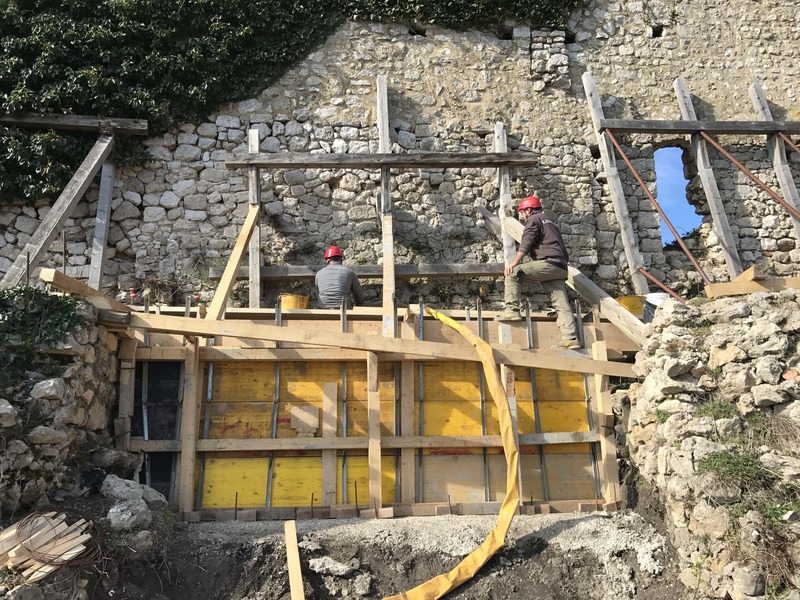 Below we bring you performed steps that were needed for the reconstruction of the eastern part of the fortification walls in the town of Krk. 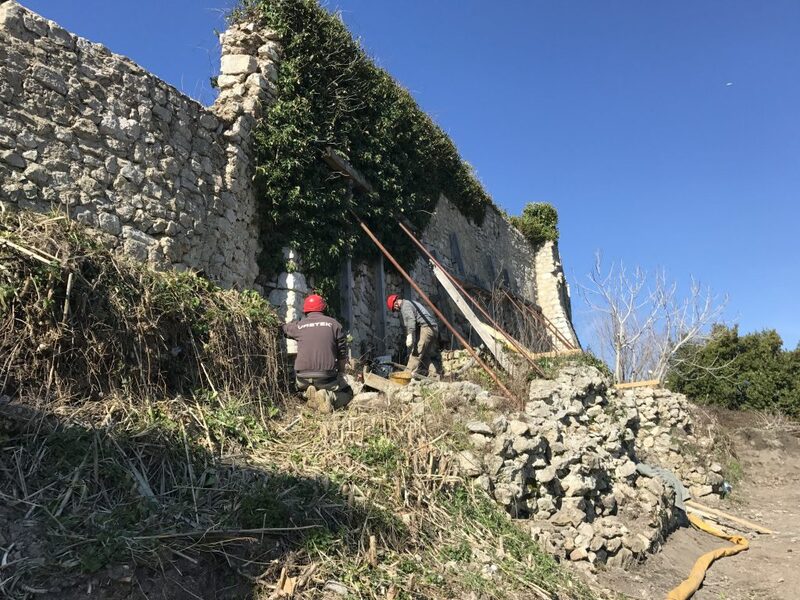 Before starting work, the temporary support structure was removed, surface vegetation was removed and the walls were cleared from ivy. 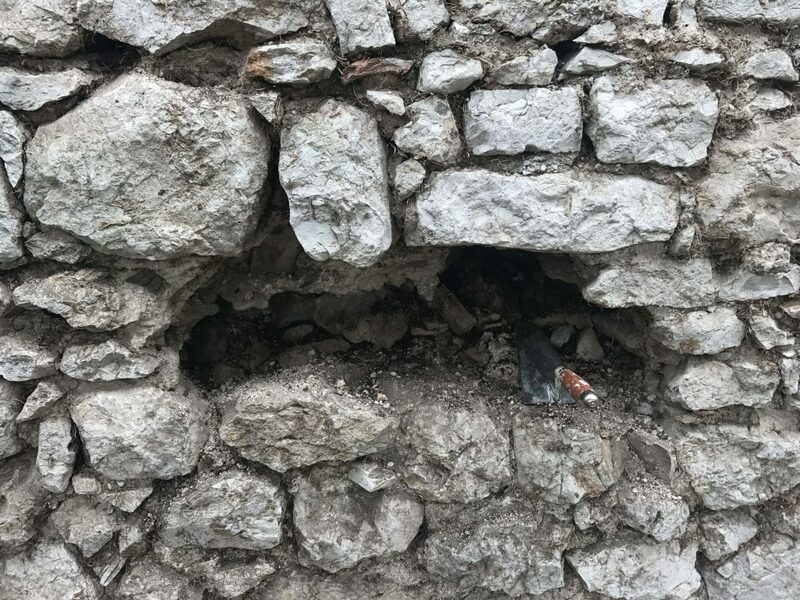 Parts of the damaged stone masonry was removed, and a part was repaired by concrete underpinning. The foundation soil of the wall and towers was reinforced by using expanding geopolymers. Stone walls joints have been cleared and cleaned and then filled with new lime mortar. In order to ensure that the stone blocks are connected the wall was then grouted and the joints were again filled with mortar to even out with the line of the wall. Selfdrilling anchors and drain pipes were installed in the lower part of the wall. 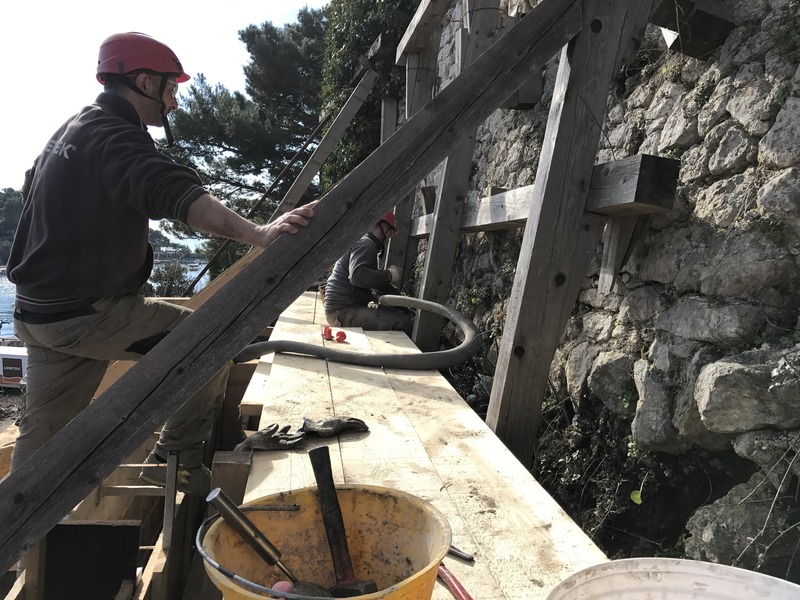 Parts of the tower walls were removed to position steel profiles UPN 280 through which self-drilling anchors with a length of 6,0 m were installed. After the installation, the walls were reconstructed with existing stone blocks in lime mortar. As a part of the reconstruction, the slope beneath the wall was stabilized for the need of a promenade that passes along the fortification walls. 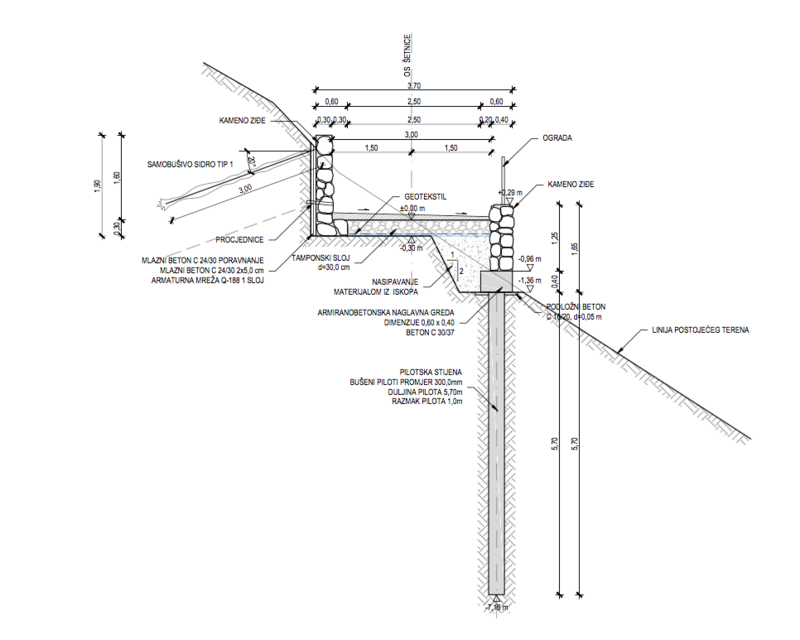 Slope stability was insured with the execution of reinforced concrete piles with a nominal diameter of 300.0 mm, 5.7 m in length, on a horizontal distance of 1.0 m. Piles were connected with a pile cap with the dimensions 0,6 x 0,4m and a reinforced concrete wall was executed on top for the need of the promenade. 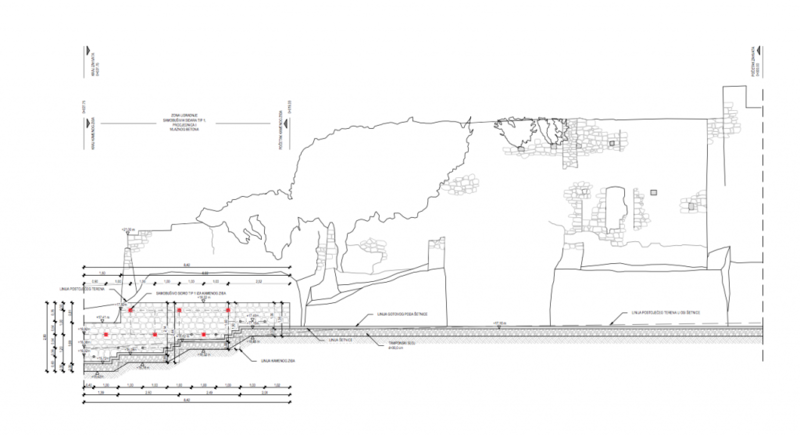 During the execution of wall remediation work we have conducted professional and design supervision. After the performed remediation a geodetic 3D survey was made. The design of the remediation of the fortification walls was performed in coordination with the department of conservation.